Please visit iTunes for sound samples. Many have long celebrated the fact that this dyed-in-the-wool bluesman has never been one to give in to fads, excesses or over-the-top antics. Sugar Ray sings, plays and writes from his heart. This is apparent on Evening which also reunites Sugar Ray & the Bluetones with guitarist Monster Mike Welch for this set of Chicago Blues. Whether it’s Johnny Young’s “I’m Having A Ball,” Otis Rush’s “You Know My Love” or any number of the superbly crafted originals, Sugar Ray delivers – as do the Bluetones on this their 5th album for Severn Records! 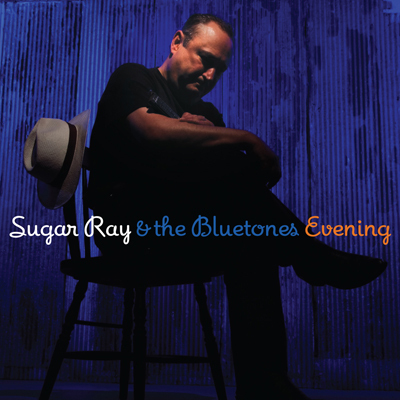 Check out Sugar Ray & the Bluetones other Severn titles: Rockin’ Sugar Daddy; Sugar Ray & the Bluetones Featuring Monster Mike Welch; Hands Across the Table; My Life, My Friends, My Music; and Living Tear To Tear. If you’re listening to this exceptional disc by Sugar Ray & The Bluetones and reading these notes, consider yourself one of the blessed—a true and faithful follower of the religion of blues. But if you aren’t already one of the annointed, fear not, you soon will be. Simply put, blues IS a religion and Sugar Ray Norcia has thankfully been preaching our gospel from dimly lit juke joints to large festivals across the U.S. and the world for a good many years. The stage is Sugar’s pulpit and the great blues masters wrote the scripture he carries in his heart and in his soul. Many of us have long celebrated the fact that this dyed-in-the-wool bluesman has never been one to give in to fads, excesses or over-the-top antics. He doesn’t need to and he won’t cater to those who prefer their music that way. Why? Because he’s sincere—truly and unshakably dedicated to his art. Blues is Norcia’s language, our language, and he speaks it more eloquently than any honest-to-goodness preacher or late night television evangelist ever could. Randomly select any one of the dozen songs here for your proof. Whether it’s Johnny Young’s “I’m Having A Ball” or Otis Rush’s “You Know My Love,” Sugar Ray delivers—as do the Bluetones—at each and every turn. Further evidence lies in any number of the superbly-crafted originals. Bear witness to “Hard To Get Along With” and “(That’s Not Yet) One Of My Blues,” or “Too Many Rules And Regulations.” Sugar is indeed preaching, but he’s not preaching what some would consider ‘old-fashioned’ blues. He doesn’t sing about chopping cotton or plowing behind a mule as some no account boll weavil and his family ruin what would have been a perfectly good crop—Norcia’s preaching what equates to the blues’ New Testament. It’s current, up-to-date and it relates to every one of us—provided we’ve been baptized.